Electroless nickel is an excellent choice of surface technology for the oil and gas industry. As discussed in previous blog posts, the properties of elctroless nickel coatings are highly sought after in the industry, including corrosion resistance, uniformity of deposits and abrasion resistance. These properties have resulted in the widespread use of electroless nickel coatings in valves and flow control devices, which are critical components in the operation of a well where good performance and long life are major economic factors. The application of electroless nickel to mild steel ball valves is now typical in the oil and gas industry, replacing hard chromium as a corrosion resistant, smooth and uniform coating. Successful applications of electroless nickel have been observed in all areas of the oil and gas industry. In crude oil production, mild steel ball valves have a maximum life of no more than three months, and fail due to corrosion, surface cracking and erosion. But valve components plated with electroless nickel last for years with no surface deterioration. Similar benefits have also been observed on ball valves at plants using the sea water injection system which involves pumping sea water under high pressure to force oil to the surface. With a coating of electroless nickel, the valves withstand the conditions and no degradation is detectable after years of operation. 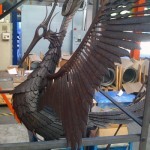 Here at us, we are regularly approached by artists and metal sculptors who want a cost effective, corrosion resistant method of plating their work. As you can imagine, sculptures made of any material are susceptible to wear, corrosion, and weather damage as a result of the elements. 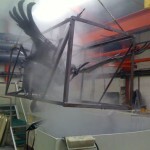 That’s why using a coating such as electroless nickel plating is perfect for metal sculptures that are to be displayed outside; the nickel coating is incredibly corrosion resistant and can protect the piece for tens of years to come. 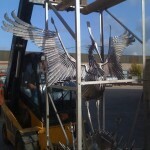 This particular sculpture was commissioned for use at the entrance to an industrial park in Castleford in West Yorkshire. 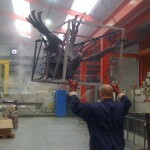 Fabricated using mild steel, the sculpture took the shape of a phoenix with its wings spread, rising from what appeared to be an abstract representation of flames. It really was a truly stunning piece of sculpture; there was something very majestic and impressive about its large open wings and long bowed head. 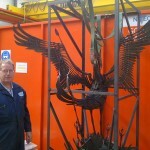 The staff at us built a special plating tank in order to accommodate the phoenix sculpture, one that would be big enough to comfortably house the piece and ensure that the nickel plating process would achieve the best and most accurate results. 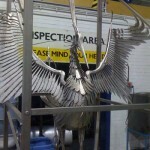 The sculpture itself was a very delicate and complicated shape; the wings alone were made up of a number of intricate metal feathers which had many recesses and sharp angles that needed to be covered fully with the electroless nickel coating. Electroless nickel plating is the perfect metal plating solution for projects with unusual and complex shapes such as this sculpture because the electroless nickel can be deposited evenly on its surface. It will also ensure that the sculpture is protected against the formation of rust, and will not flake or chip like a painted surface can do.